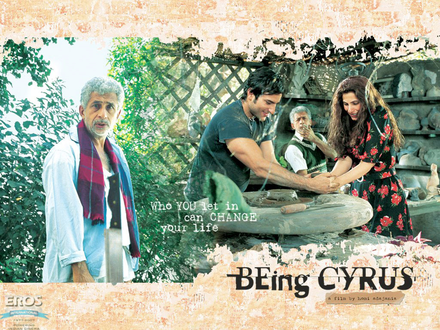 Review Summary: BEING CYRUS is more of a Festival film that should ideally appeal to the elite and mature audiences at the metros in the domestic market. With the influx of multiplexes, novel concepts and offbeat themes are being attempted with amazing regularity. BEING CYRUS is more of a Festival film that should ideally appeal to the elite and mature audiences at the metros in the domestic market. Homi Adajania surprises you. First, by choosing an intricate psychological drama for a storysetting for his first film. And then, by choosing a very Parsi setting for his film, with Parsi characters with Parsi names that surprisingly don't end up branding his film as an inyour-face Parsi drama. But what's most surprising is the felicity with which this debutante director tackles the complex scenario of an extremely well written psychological drama and lets it develop as each really well defined and differently motivated character goes through the storyline, carrying his own baggage and motives through two distinctly different-toned halves that go on complete a complex picture and make Being Cyrus a memorable entertainer. A feature film by a photographer has a few advantages.